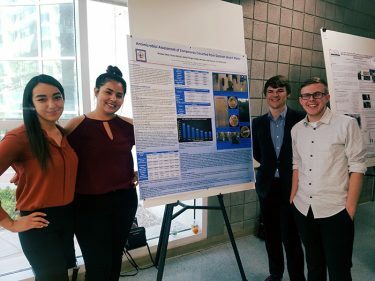 A team of GCU Research and Design Program students working under College of Science, Engineering and Technology professor Dr. Ramesh Velupillaimani and a student of Dr. Karen Denzler from the Center for Antimicrobial Products recently presented their research findings on antimicrobial products from desert plants. 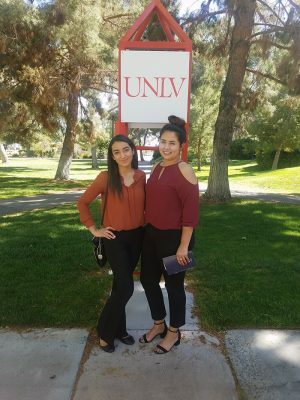 The presentation was made April 21 at the 57th annual meeting of the Arizona/Southern Nevada Branch of the American Society for Microbiology at the University of Nevada, Las Vegas. It was organized in conjunction with the Arizona/Nevada Academy of Sciences annual meeting. Students who presented included Sonia Molina, Karla Villegas, Nicolas J. Sever and Brady Johnson. Here’s a link to the event. GCU students Sonia Molina, Karla Villegas, Nicolas J. 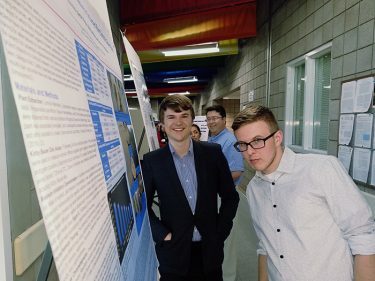 Sever and Brady Johnson (from left) presented their research on antimicrobial products in desert plants. Molina and Villegas are part of GCU’s Research and Design Program. Sever and Johnson present at the recent 57th annual meeting of the Arizona/Southern Nevada Branch of the American Society for Microbiology at the University of Nevada, Las Vegas.